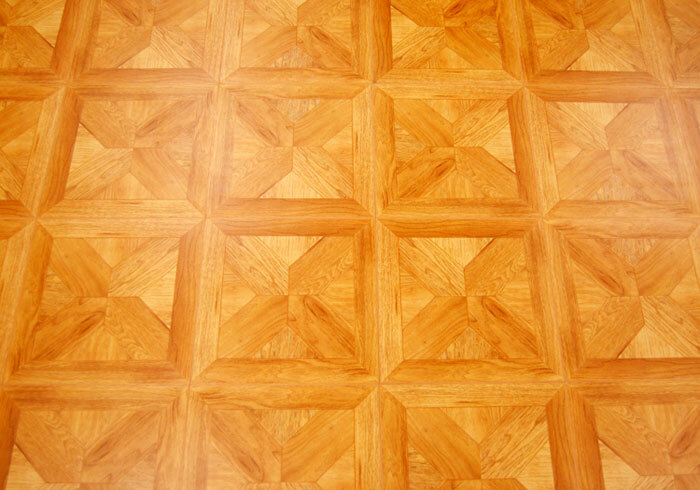 ThermalDry® Parquet Floor Tiles are available as 1' x 1' floor tiles. Each tile rests on a plastic peg base, with a vinyl surface that sports a parquet floor design. We can install this floor system in your home quickly -- usually in less than two days -- with no nails, adhesives, or grout required. 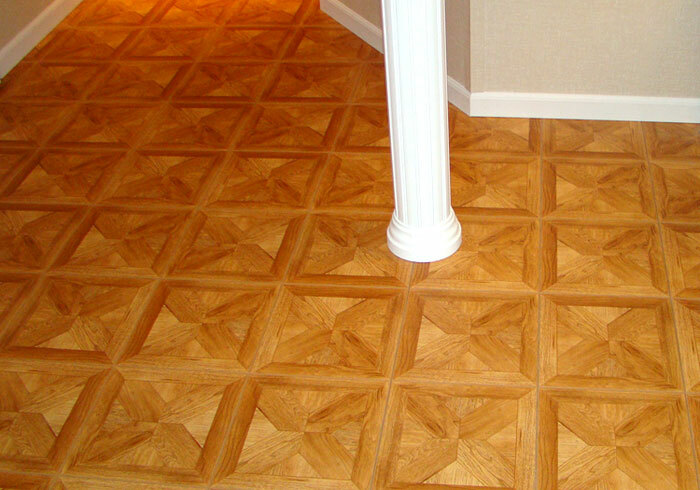 Unlike traditional wood parquet flooring, these floor tiles will not be damaged by water or humidity. Like our other ThermalDry® Floor Tiles, this flooring option rests on raised plastic pegs that create an airspace between the floor's surface and the concrete slab. 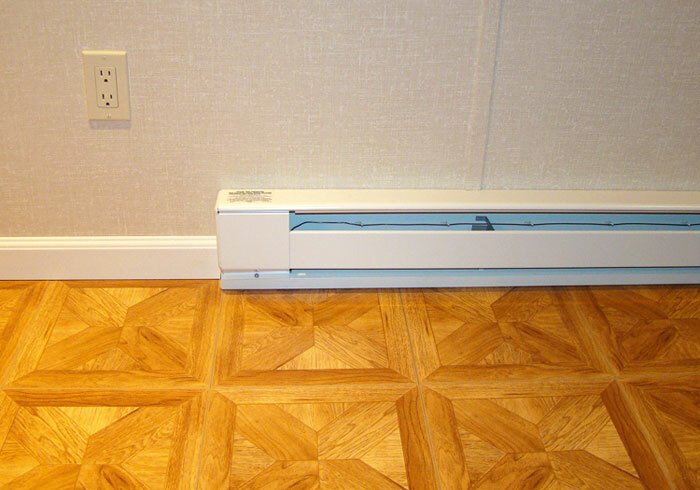 This creates a thermal gap on the floor that makes your floor 8-10 °F warmer than the cold concrete below. We have nine different basement flooring options that can be customized to create almost any flooring design you can imagine! Contact us by phone or e-mail today to learn more! We offer free, no-obligation basement flooring installation quotes for homeowners in Canada, the United States, the United Kingdom, and Ireland! Once installed, ThermalDry® Floor Tiles create a vapor-retardant surface on your concrete slab floor. This prevents moisture and humidity from rising through the concrete slab, where it would create a humid environment in your finished basement. When installed in a basement, typical parquet flooring is vulnerable to damage from basement flooding, as well as from humidity rising up from the concrete slab. Once this moisture collects in the flooring, it will buckle, rot, discolor, and release a musty odor. 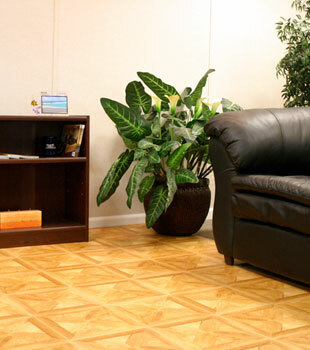 Our ThermalDry® Parquet Floor Tiles are completely inorganic, and will not be damaged my mold, rot, or humidity. This keeps your floor looking attractive for many years to come -- and much longer than traditional parquet flooring! Customize With Our Other Floor Tiles! Each of our ThermalDry® Flooring (including our carpeted, tiled, and parquet designs) snaps together to allow for customization in design. Many homeowners choose parquet or tiled flooring for a basement bar or living room, while choosing our carpeted tiles in a bedroom or children's play area. Learn about our other Basement Flooring Systems. 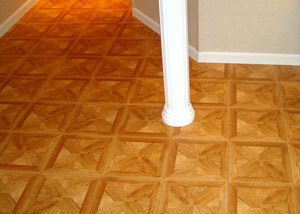 We Can Install Beautiful New Tiled Flooring In Your Basement! We can install a customized basement floor system in your basement quickly -- usually in two days or less. 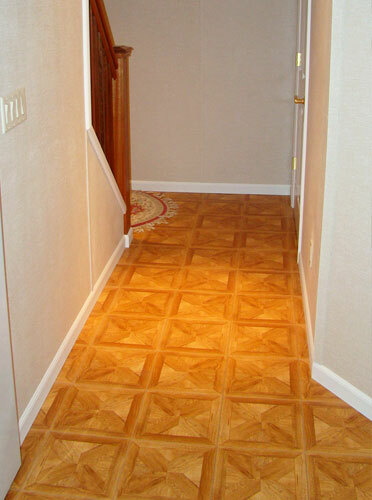 Our warm, attractive flooring is a beautiful addition to any finished basement! To meet with one of our basement experts for more information on our flooring options, call or e-mail us today! We'll set up an appointment with you for a free basement floor finishing quote! Our quotes come with no obligation and include a professional consultation, on-site inspection and measurement, and a written cost quote. Before our scheduled appointment, you will also receive a mailed, complimentary copy of our full-color basement book! The Basement Systems Network has dealers operating throughout Canada, the United States, Ireland, and the United Kingdom. We have a certified dealer in your neighborhood that's ready to serve you!